The Pontiac Fiero was introduced by General Motors for the 1984 model year as the American answer to foreign born compact sporty-cars. No, not sports cars, but sporty-cars -- the Fiero was never intended to compete with the Corvette and ultimately that is what held it back. In the same way that the 914/Boxster could never be as fast/powerful as the 911, the Fiero was held back at the starting gate and forced to run on 3 legs...but that doesn't mean you can't buy a race winning Fiero today. 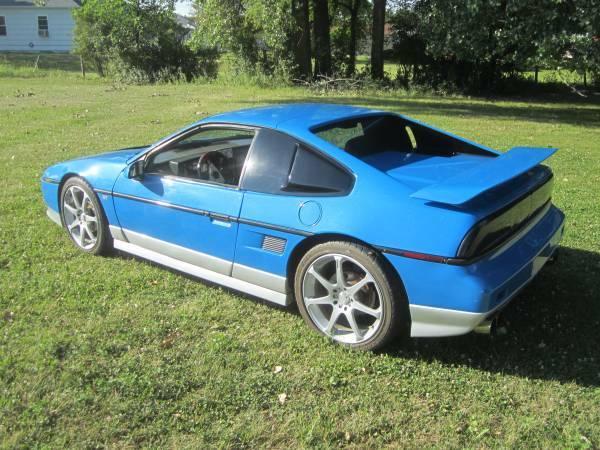 Find this 1987 Pontiac Fiero GT V8 Conversion offered for $10,000 in Fargo, ND via craigslist. 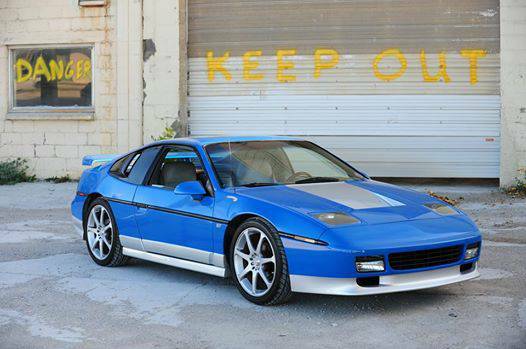 This Fiero GT started life as a V6 (or iron duke inline-4) powered fastback, but it has been given a thorough make over, starting with a custom fiberglass nose and flush mounted non pop-up headlights -- all of which is covered with a two tone paint job -- personally I think it is an improvement over the stock Fiero looks. Situated behind the driver, but in front of the rear wheels, is an LT1 V8 from a 1996 Chevrolet Corvette that is mounted to the Fiero transmission via a V8 Archie adapter kit. Expect something around 350 horsepower from the 5.7 liter lump of American iron -- a significant upgrade from stock. The inside features a few custom bits including an aftermarket (Grant) steering wheel, wood dash accents, and aftermarket temp/volt/oil press gauges in the stock Fiero gauge pod. 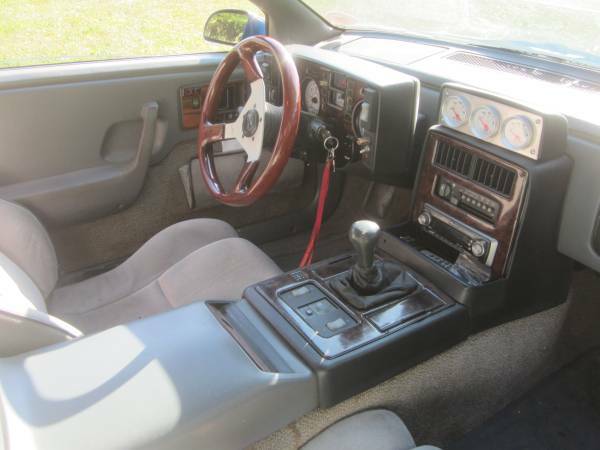 The normally gigantic Fiero shifter is toned down with a short shifter and custom knob/boot. The writing in yellow says it all. Seductive, but see the STD test results before diving in. as it were. Twice the fire, twice the fun. Literally speaking of course. My God, the exhaust actually has cats! Of course, they're the kind that won't be smog-legal in CA unless they were made before 2008. Would be better with an aluminum LS1/LS3/LS6 of course, but for what it is it looks pretty good. This one does look well done compared to most hacked-in swaps we find on CL. For my time/money though, I'd want an LS4 - the only GenIII+ engine designed for transverse applications. No, the LS4 shares its bell pattern with various FWD 3.1/3.4/3.8 V6s (and, I think, the Shortstar from the Olds Aurora). GM did a version of the F40 6-speed transaxle for the V6-powered Pontiac G6 GXP. So an LS4 will bolt up directly to that transaxle. There were a bunch of new-on-pallet G6 F40s on eBay a couple years ago for relative peanuts. There's also a Quaife differential available for it. 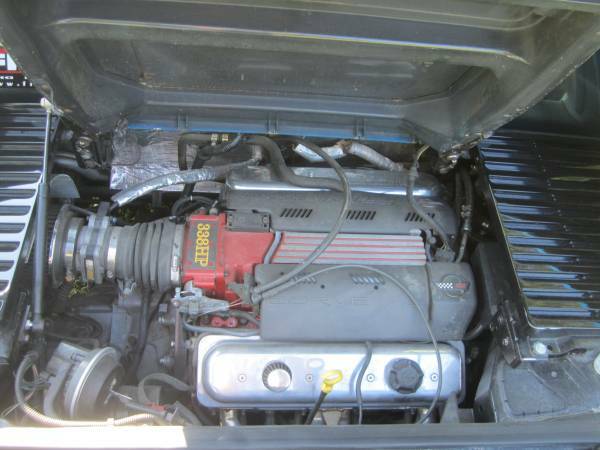 That transaxle was used in a few curious applications, in the US V6 form it was a pretty wide-ratio box (which is certainly fine for a V8 Fiero) but there were also versions used in various Opel/Vauxhall models, the only one that could be considered 'close ratio' was used in a couple FWD Alfas. A ginourmous super charger sticking out of the hood would only block the view behind you, which with a ginourmous supercharger would be irrelevant.